It’s been said time and again by economists, housing experts and real estate professionals alike a boost in residential housing starts is the key to meeting high buyer demand and slowing home price growth, which is currently at 6.6 percent year-over-year. Historically and presently, home prices are highest on the West and East Coasts and are lower in the South and Midwest — two facts that can be linked to the rate of new residential housing starts in those latter two areas. According to a handy visualization by Fixr, a website that helps homeowners perform cost analysis on remodeling and repair projects, states in most need of new housing, such as California, are lagging behind in the number of building permits needed to fulfill buyer demand, while other states, such as Texas, are building at a robust pace. 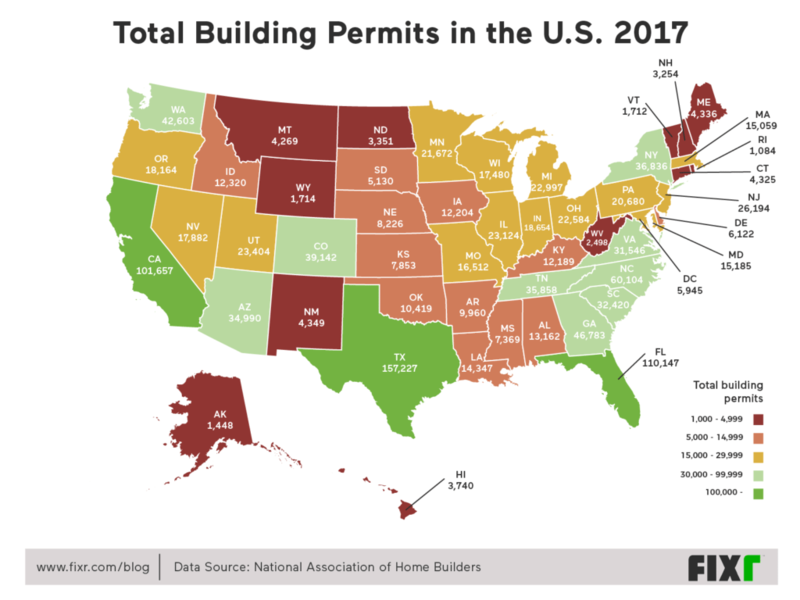 When looking at the number of building permits given, Texas (157,227), Florida (110,147) and California (101,657) top the chart with 100,000+ permits being approved in November 2017 alone. Fixr data analyst Yuka Kato says the uptick in building permits in Texas and Florida are due, in part, to rebuilding efforts after hurricanes Harvey, Irma and Maria. North Carolina and Georgia rounded out the top five with 60,104 and 46,783 permits, respectively, and other southern and midwestern states such as Tennessee, Illinois and Ohio also had a relatively healthy number of building permits ranging anywhere from 15,000 to 99,999. On the other hand, states in the far north and northwest, such as Maine, Massachusetts, Connecticut, Montana, North Dakota and Wyoming, hovered around the 5,000 building permit mark. Although the raw building permit numbers are an important starting point, Kato says looking at the number of building permits per capita is a better measurement for determining how well a certain market is doing. 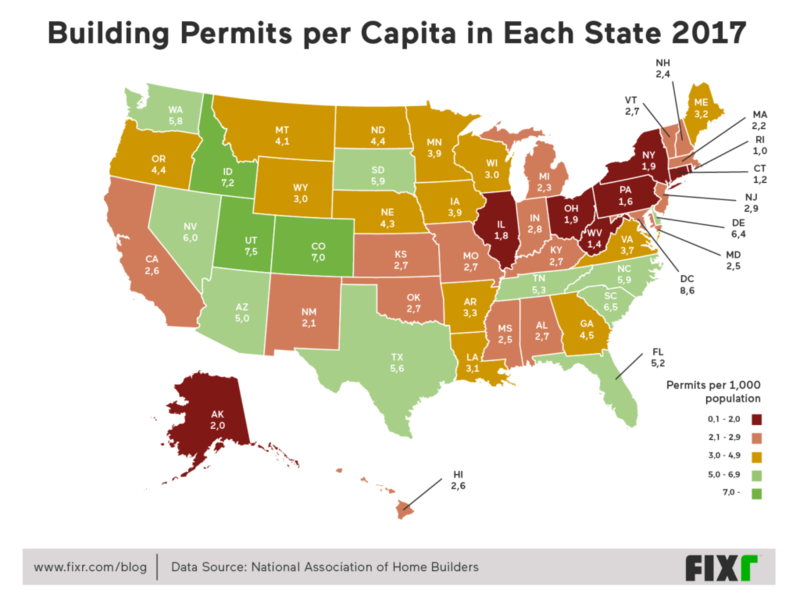 The District of Columbia (8.9), Utah (7.5), Idaho (7.2), Colorado (7.0) and South Carolina (6.5) jumped to the top of the list for the number of building permits given per 1,000 residents. Meanwhile, California (2.6), which topped the list for the raw number of permits given, sinks to the bottom when population is taken into account. Other high-priced states such as New York (1.9), Alaska, (2.0) and Hawaii (2.6) also fell short.